The German region with 704 hectares of vineyards is named after the two rivers, in the narrow valleys on the southeast and southwest slopes of the terraced Vineyards are lying. The vineyards extend over three federal states in Germany, Over 90% of these are in Saxony-Anhalt, the rest in Thuringia and only a few hectares in Werder an der Havel in the state Brandenburg, Viticulture has been practiced here for over a thousand years. In a deed of donation of emperor Otto III. (980-1002), a grandson Charlemagne's, this is already documented in the year 998 in writing to the monastery Memleben. Another document testifies vineyards in the area Mansfelder Seen already in 973. The Cistercian Founded in 1137 the monastery of St. Maria ad Portam (today Landesweingut Monastery Pforta ) and laid in 1154 the still existing today Pfortenser Köppelberg on. The old winemaking tradition testifies to a grape in the city coat of arms of the city of Jena, in which the Friedrich Schiller University was founded in 1554. 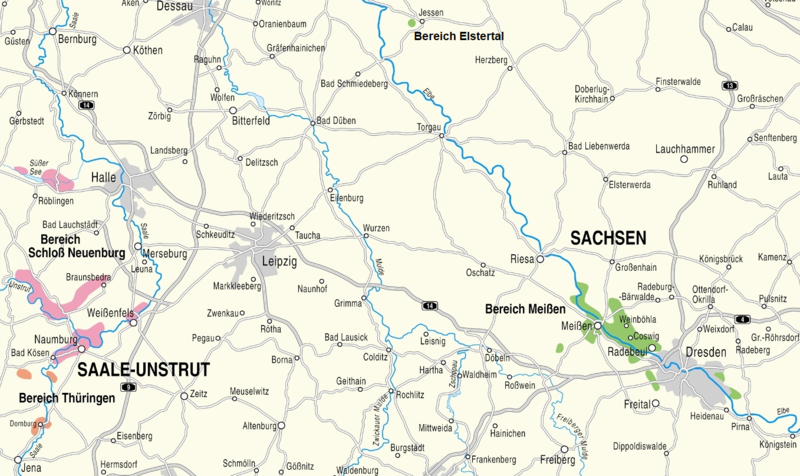 At that time, the Thuringian vineyard was about 10,000 hectares. This page was last modified at 9 April 2019 at 10:45.